There are two options for publishing metadata from a WCF service. By default, the services metadata is not published. In order to make the services information about itself public, you must do either of the following. Provide the metadata over HTTP-GET automatically. Thankfully, the ServiceHost already knows all about the services metadata. Metadata exchange (whether using HTTP-GET or a dedicated endpoint) can be enabled Programmatically or administratively. I find the second option by far the most popular, due to being able to modify, turn on/off after compilation, deployment. The examples I’m going to show are how to enable the metadata exchange administratively (via the config files). Bear in mind, that HTTP-GET is a WCF feature (may not be supported by all platforms). Where as using a dedicated metadata exchange endpoint is an industry standard (WS-MetadataExchange). Often the best way of explaining something is by example, so that’s what I’ll do here. Most of the examples are shown using the HTTP transport. Although, I also show the TCP and IPC transports using the mexTcpBinding and mexNamedPipeBinding respectively. 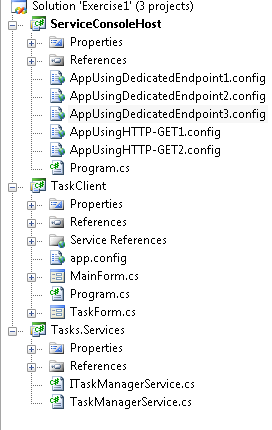 We’re pretty much just going to focus on the config files in the services project, that’s ServiceConsoleHost. <!--By default, the address the clients need to use for HTTP-GET is the registered HTTP base address of the service. If the host is not configured with an HTTP base address, loading the service will throw an exception. explicit service behavior must be added. the address at which the metadata is published is the value of HttpGetUrl value plus a ?wsdl querystring. <!--If the service does not reference the behavior, the host will expect your service to implement IMetadataExchange. just rename and remove any text in the App.config file name between the App and the .config. This solution was created in Visual Studio 2008.
on the Message Endpoint pattern on the way home from work a few days ago. From my experience, this wasn’t necessarily true. So I decided to confirm my suspicion. The following is a mix of what I read and tested out. Not all bindings support callback operations. Only bidirectional-capable bindings (TCP, IPC) support callback operations. and therefore you cannot use callbacks over the BasicHttpBinding or the WSHttpBinding. The MSMQ bindings also don’t support duplex communication. one for the calls from the client to the service and one for the calls from the service to the client. Two way communication can be set up for MSMQ bindings by using two one way contracts. The CompositeDuplexBindingElement is commonly used with transports, such as HTTP, that do not allow duplex communications natively. for the service to send messages back to a client. When you use either the NetTcpBinding, NetPeerTcpBinding or the NetNamedPipebinding, the callbacks enter the client on the outgoing channel the binding maintains to the service. There is no need to open a new port or a pipe for the callbacks. because HTTP itself is a unidirectional protocol. 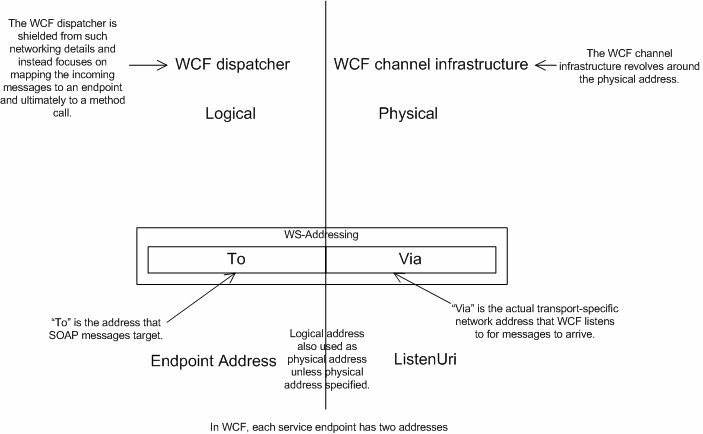 WCF auto-generates a ClientBaseAddress if one is not explicitly set by the user. and it passes the service a callback address that uses HTTP, the client machine name, and port 80. While using port 80 makes sense for Internet-based services, it is of little value to intranet-based services. and the client will not be able to host the callback endpoint. which you can use to configure a different callback address on the client. and configuring the clients base address in the clients config file. The client must expose an address at which the service can contact it to establish a connection from the service to the client. This client address is provided by the ClientBaseAddress property. 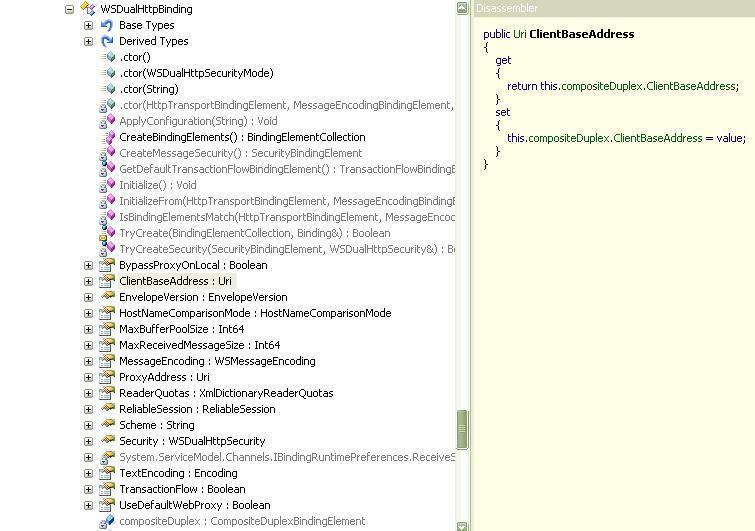 WSDualHttpBinding.ClientBaseAddress uses the CompositeDuplexBindingElement’s ClientBaseAddress property. The problem with using a config file to set the callback base address is that it precludes running multiple instances of the client on the same machine, which is something you are likely to do in any decent testing scenario. 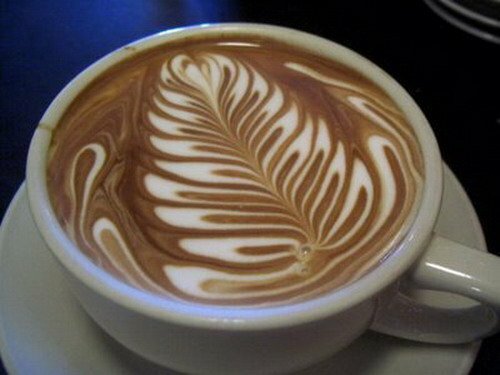 However, since the callback port need not be known to the service in advance, in actuality any available port will do. It is therefore better to set the client base address programmatically to any available port. This can be automated by using one of the SetClientBaseAddress extension methods on the WsDualProxyHelper class. There’s also a good description of how to implement callbacks in WCF in the MSDN Duplex Services item. I’ve also implemented something similar in a project I worked on last year. It used a singleton service, and has about 30 clients hitting it at any one point in time. In this example, I share a listenUri between two endpoints. We have one service implementation that has two service contracts. Each service contract will have it’s own endpoint. Each endpoint will share a listenUri. We’ve also setup an endpoint for our metadata exchange. I’ve done all of this imperatively. You should see output like the following. Now run the Client project in the debugger. You should see output like the following, once you’ve hit Enter twice. 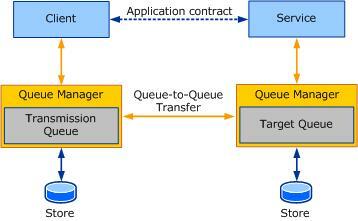 NetMsmqBinding only works if you have WCF on both sides of the Queue-to-Queue transfer. MsmqIntegrationBinding is targeted toward existing MSMQ applications that use COM, native C++ APIs or the types defined in the System.Messaging namespace (as stated by MSDN). Messages from one of the bindings are not compatible with the other binding type. MsmqIntegrationBinding uses a pre-WCF serialization format, by way of the SerializationFormat property, which is of type enum MsmqMessageSerializationFormat. The members being: Xml, Binary, ActiveX, ByteArray, Stream. BinaryMessageEncodingBindingElement.MessageVersion which is only available on the NetMsmqBinding specifies the WCF supported versioning information. How do we set the security mode on the standard msmq bindings? NetMsmqBinding.Security gets the NetMsmqSecurity associated with this binding. MsmqIntegrationBinding.Security gets the MsmqIntegrationSecurity associated with this binding. MsmqIntegrationSecurityMode in the case of MsmqIntegrationSecurity.Mode. NetMsmqSecurityMode in the case of NetMsmqSecurity.Mode. According to this MSDN post, it appears as if the default security mode is Message for NetMsmqBinding and Transport for MsmqIntegrationBinding. The default security mode for both NetMsmqBinding and MsmqIntegrationBinding is Transport. I’ve done a few projects based around the .Net WCF Framework and have decided it’s time to consolidate some of this knowledge (experience?) and aim for the TS: Microsoft .NET Framework 3.5 – Windows Communication Foundation Certification. I’m by no means an expert on the technology yet, but who knows, maybe I will be one day. I’m going through a few books and projects I’ve worked on and I’ll be recording the information I personally see as being important to remember (with a focus on the exam).